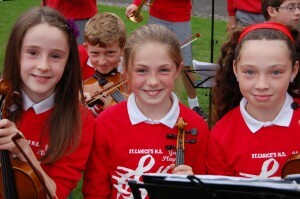 St Canice’s Instrumental Music Programme was founded thirty two years ago by Regina O Leary and Peggy Carey. With a handful of violins and recorders, they established what is now the current instrumental music programme. From humble beginnings, the programme expanded over the years with the acquisition of more instruments, music teachers and an ever-increasing number of enthusiastic students! The first school orchestra, formed in the mid 80’s, had its first win at Feis Ceoil in 1988 and has since gone on to win this prestigious competition an amazing twenty-two times. The ethos of the programme is ‘music for all’ and today it caters for over 400 children. Eighteen music teachers provide tuition in wind, string and brass instruments as well as piano, vocal, pre-instrumental and music theory. The Senior Orchestra is the flagship of the programme, which includes two orchestras, (senior and junior), two jazz bands (senior and junior), concert band, recorder ensemble and chamber music ensembles. There is also an adult music programme with over thirty adults involved in violin and cello tuition, who also form part of the ‘Gateway Orchestra’. This is the fifth time St Canice’s have performed at the IAYO Festival of Youth Orchestras.